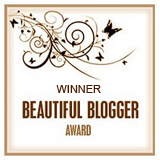 So awhile back the awesome KD nominated me for the Beautiful Blogger Award! Thanks!! Thank the blogger who nominated you, share seven things about yourself and pass the award along. Done and done, my friend! 1) I enjoy gardening, enough though I hate the creepy crawling bugs that seem to go hand in hand with it. 2) I’m obsessed with honey dill sauce. I’ve been tempted more than once to just eat spoonfuls right out of the jar. 3) My favourite colour is blue, yet most of my clothes are purple and black. 4) I have one brother, three step brothers and two step sisters. Not to mention a sister-in-law and brother-in-law. 5) I began practicing meditation in 2009 and found it’s the one thing that keeps my re-occurring bouts of depression in check. 6) The very first novel I tried to write involved the New Kids on the Block. (Give me a break I was twelve!) I never did finish it. 7) The last time I ate a Big Mac was 1996. Beat that! And now to pass along this award….